Canopy Growth’s growth ambitions in the United States got a new leg up earlier today when the Canadian Cannabis giant announced to have acquired American hemp cultivator AgriNextUSA. The financial details of the acquisitions are yet to surface. AgriNextUSA remained one of the most vocal advocates for regulating hemp in the United States that was helping to build a legalized hemp industry in the country. With the acquisition of AgriNextUSA, Canopy Growth will be able to accelerate its growth in several key states amid the 2018 Farm Bill that opened up the possibility for treating hemp as a crop. Canopy Growth has been eyeing to expand into several U.S. states in anticipation that Cannabis products will soon be regulated and the acquisition of AgriNextUSA would open the door for them to expand their operations in the country. Geoff Whaling, the CEO of AgriNextUSA, is a hemp pioneer and remains a leading advocate for the industry in the U.S. After the acquisition, he is planning to join the Canopy Growth USA as a strategic adviser that will further bolster the core competency of the company. “Our significant investments, acquisitions, and compilation of talented leaders such as Geoff will position us for swift expansion throughout the United States. By collaborating with a pioneer like Geoff who has been involved with our team since our earliest days in 2013, we will aim to turn hemp supplied by American farmers into a wide range of products,” said Bruce Linton, the CEO of Canopy Growth, while welcoming Mr. Whaling to the company. Financial terms of the deal were not immediately released with the announcement, the news did not have any immediate impact on the stock price of Canopy Growth. However, we see a Symmetrical pattern forming on the daily time frame as well as on the Stochastic RSI oscillator. As the stock is trading around the pivot zone around $46.65 per share, if there is a breakout attempt on the downside, the $43.00 per share level should provide adequate support. 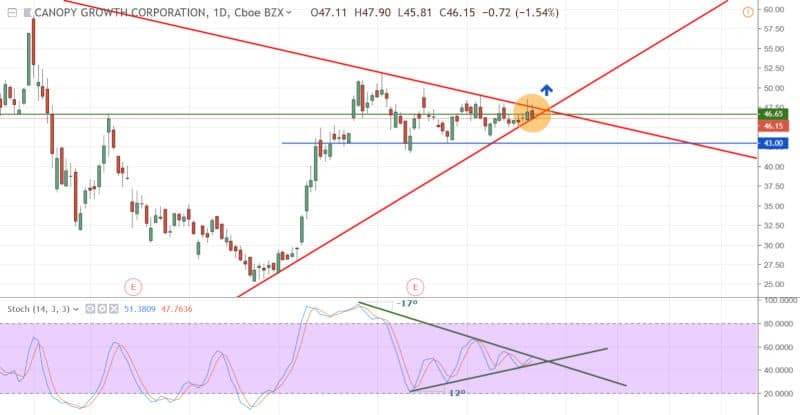 On the other hand, if we see the stock breaking out above the Symmetrical Pattern, investors should wait for the price to close above $50.00 per share before increasing their exposure to the company. The formation of Symmetrical patterns will indicate major price movements in the future and given the latest acquisition of AgriNextUSA, there is a high probability that the stock price of Canopy Growth will move upward from here.